The theme of this issue of Parabola is “The Journey Home,” and as we see from the rich selection of essays, poetry, and art in its pages, “Journey” and “Home” are of equal import. Our life is a journey and there are homes to reach, during this life and also at its end and perhaps beyond. Life as a purposeful quest is exemplified in the odyssey of Ram Dass. Born as Richard Alpert, celebrated then shunned in the 1960s for his work with Timothy Leary and psychedelics, he fled to India and returned as Ram Dass. For the past half century he has been a towering spiritual leader despite a devastating stroke twenty years ago that left him physically helpless. 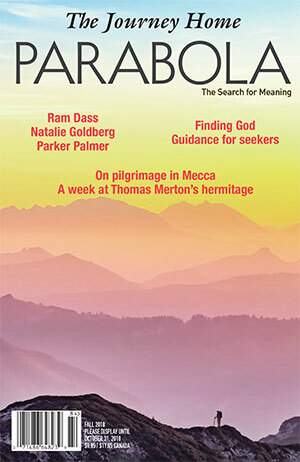 In this issue, Ram Dass and his friend Mirabai Bush speak eloquently of the last stages of the journey of life and of what may follow. We can experience the journey home in every moment, as we return to awareness of our bodies and ourselves on the earth, as indicated in an interview with Abhijata Iyengar, the granddaughter of the yoga guru and a teacher in her own right. And in the moment we can also journey to an awareness of the God or the Higher, a possibility explored by Rabbi Eliezer Shore in his essay here. Between the moment and the entire life there arise a multitude of journeys home. Among those depicted here are that of a modern Muslim woman, Zainab Salbi, to her religion’s home of Mecca; the re-engagement with town life of Buddhist teacher Vajragupta after a wilderness retreat; the return to peace of wounded warriors, explored by physician David Kopacz and Native American visionary Joseph Rael (Beautiful Painted Arrow); and even a meditation on South African bees returning home, from naturalist Neil Rusch. Further contributions from renowned Zen author Natalie Goldberg, Trappist monk Br. Paul Quenon, Parabola’s Tracy Cochran, and other insightful voices complete a special issue that we hope will serve you well during your own journeys home.